One of Saddam Hussein's closest aides, Izzat Ibrahim al-Douri, died of cancer, a website run by members of Iraq's former ruling Baath party says. His death was first announced by the Baath party on Friday, but no details were given then. He had leukaemia. Douri, 63, was the most senior figure in the former regime still at large. The US had offered a $10m reward for information leading to his capture. The BBC's Jim Muir in Baghdad says the Americans regarded Douri as their most wanted man, after the leader of al-Qaeda in Iraq, Abu Musab al-Zarqawi. Earlier, Iraqi Prime Minister Ibrahim Jaafari said that Douri's death would be good news for Iraq and bad news for the insurgency. But the US military is treating the news with caution. Spokesman Lt Col Steven Boylan said the reported death could be a ruse. "How much of this is pure propaganda to say he is dead is hard to know," Lt Col Boylan said. "He's an important figure for us to know whether he's alive or not." Douri was number six on the US list of 55 most-wanted members of Saddam Hussein's regime. The top five have all been captured. He was diagnosed with leukaemia several years ago - but his subsequent recovery enabled him to pursue a challenging domestic and foreign work schedule. 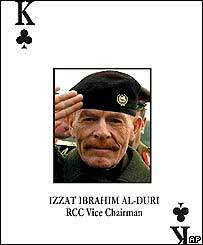 He often represented Iraq at foreign gatherings - most markedly in the run-up to the US-led invasion of April 2003. There have been persistent reports that he was unwell ever since he went into hiding following the invasion. Born in Tikrit, the former Iraqi leader's home town, Douri was considered to have been Saddam Hussein's daily right-hand man. Douri was deputy commander-in-chief of the armed forces, and held a senior post on the committee responsible for northern Iraq when chemical weapons were used in 1988, killing thousands of Kurds. He served as vice-chairman of the Revolutionary Command Council and was a key commander in the suppression of the failed Shia uprising in 1991. War crimes charges have been issued against him in Austria.